I find myself in this odd in-between space, and I'm not sure what to do with it. Clearly, I'm overwhelmed. Clearly there are bad days. Clearly there are things falling off the table. But I'm not depressed (and my therapist agrees). For me, true depression steals away my words for weeks - even months - on end. And that's not where I am right now. For what it's worth, antidepressants did that too, so I'm going to try to avoid them for the foreseeable future (and since my therapist thinks I'm not really depressed, they're not really the right approach anyway). Clearly, anything that changes such a fundamental part of me is a problem - normally if I don't write, I eventually feel like words will come pouring out of my ears, and when I'm depressed, there are simply no words, and having tried it before, that's no way to live. However....this week I go back to work. This week I give up another 9+ hours a day out of days that are already too full. And all the things not done sit heavy on my mind - some little, some big, but none likely to be handled anytime soon. I think we're mostly hunkering down and waiting for the storm to pass. Hello! I am right there with ya! Not quite dpressed but so much going on I'm definitely not singing in the rain! LOL! 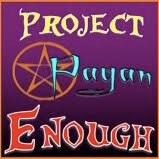 New follower from Pagan Team on etsy! I look forward to a new friendship!! Feel free to follow me as well if you'd like! Bright Blessings!